When shopping for Harley Davidson motorcycles, buying the right model is the best way to enjoy your new set of wheels. As they have a good selection of different models, speaking with a dealer is a good way to determine which model is right for you. Additionally, by comparing bikes like the Harley Davidson Road King and the Harley Davidson Fat Boy, you can see which bike offers you the most. The Harley Davidson Fat Boy offers a classic look that resembles the choppers of the 60’s with a laid back stance and chrome accessories. 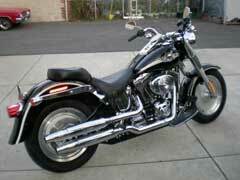 The bike will make riders enjoy the quality craftsmanship and the relax feel of cruising the streets. Additionally, one of the best aspects of the Harley Davidson Fat Boy is they are able to keep the classic look while providing some of the best technological features. They do this by hiding the electronics. Instead of having wires jutting out at all angles, they route them behind the bike so riders can enjoy the timeless look and innovative features. Speaking of innovative features, the intuitive controls make this a fun ride for bikers. This is best illustrated by the self-canceling turn signals. In turn, this will give drivers more time to enjoy their ride and less time worrying about controls. The handling of the Harley Davidson Fat Boy is outstanding as the fatter tires provide a smooth ride. The rear tire is the wider of the two at 200mm, which will provide superior traction and braking. Best of all, the tires are durable, which will give the rider peace of mind. One of the best draws to the Fat Boy is its comfortable ride. The ergonomic seat reduces back fatigue while the low position helps the rider stay more in turned to the bike. Furthermore, the full-length rider footboard gives bikers the ability to rest their boots in a wide variety of positions. For a biker looking for a classic style, innovative features and an awesome experience with the road, this bike is for you. It has everything a rider would want with a style that sets it apart from the rest. If you would like to try one out for size stop by your local dealership. While there, you can find other accessories for your ride like a Harley Davidson battery or a Harley Davidson exhaust.